Curated by Robin Dluzen and Mary Lou Zelazny. In "The New UnNatural," seven female artists examine the modern grotesque. The genre of the "grotesque" is ancient, with examples from every culture and period. Ranging from the fanciful to the hideous, hybridized figurative forms have been used by artists around the world as satire, commentary, ornamentation and ritual. For the artists in "The New UnNatural," Laurie Hogin, Amanda Elizabeth Joseph, Renluka Maharaj, Julie Potratz, Chloe Seibert, Maria Tomasula and Mary Lou Zelazny, the attraction to rough or deformed amalgamations is both personal and political. In embracing the unsettling, the absurd and the repulsive, the artists in this exhibition eschew the notion of the "beautiful," not as a feminist critique of "beauty" or its representation in art; rather, the grotesque offers a means of coping with the rising anxieties and overstimulation of our times: a callous of sorts to strengthen one's ability to withstand inescapable bombardment of stimuli. So too does the grotesque provide a vehicle for power and self-assertion, especially in the hands of women. Through the violent, technicolor chimeras of Hogin's paintings; Joseph's hyperreal, emphatically flawed female bodies; Maharaj's sensual, macabre rituals; Potratz's exaggerated, uncanny costumed performances; Seibert's ghastly, crudely wrought faces; Tomasula's viscous still-lifes; and the mongrel, Frankenstein-ed figures of Zelazny's works, each artist projects a vision of the unexpectedly terrifying that reveals a visceral female sensibility. 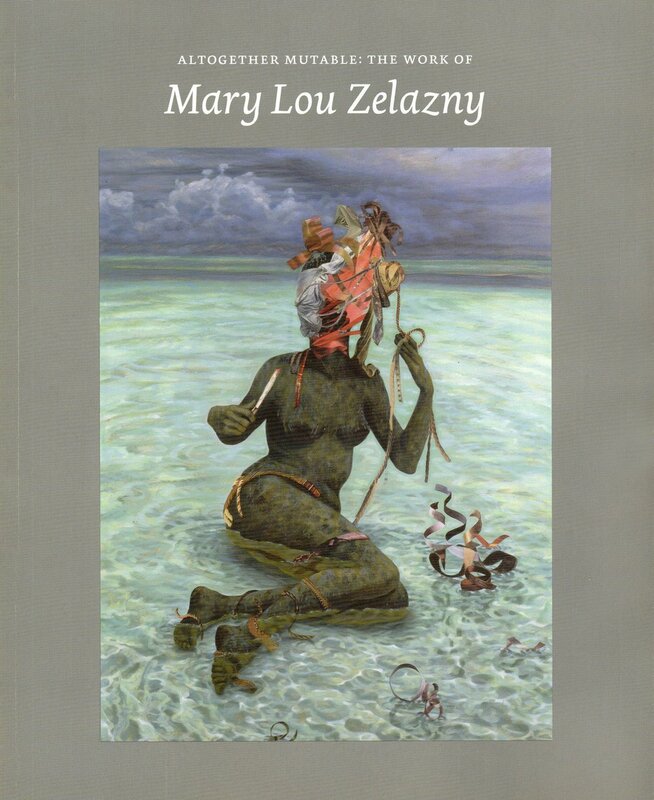 What Came After: Figurative Painting in Chicago 1978-1998, curated by Suellen Rocca, features several paintings by Mary Lou Zelazny. The show will run from September 2019 - January 2020. Ineffable, curated by Lorraine Heitzman, includes a series of paintings by Lou Carney (alias of Mary Lou Zelazny). The show will run through the month of March 2019. The Figure, Humor and the Chicago Imagists, curated by Suellen Rocca, features paintings by Zelazny, several Chicago Imagists and other Chicago artists. A symposium and panel discussion with Dan Nadel, Frank Trankina and Mary Lou Zelazny accompanies the exhibition. Paintings by Lou Carney (alias of Mary Lou Zelazny) are shown for the first time in Images on File, curated by Robin Dluzen. A City to Wear 2.0, curated by Yidan Pang & Linglin Yan, features work by Zelazny and others. Voyage Chicago interviews Mary Lou Zelazny. Read more here. Come Back with a Warrant, curated by Tony Fitzpatrick, features works by Lou Beach and Zelazny among others. Mary Lou Zelazny's fifth solo exhibition with Carl Hammer Gallery - entitled Vivarium - opens Friday, March 2, 2018. Featuring new mixed-media floral paintings and tree portraits. ~ Vibrant Bouquets from Mary Lou Zelazny, Judy Carmack Bross, Classic Chicago Magazine, April 22, 2018. ~ "Vivarium": Mary Lou Zelazny, Bruce Thorn, New Art Examiner, April 19, 2018. Zelazny awarded one of two SAIC-faculty summer residency fellowships at the Kunstmeile Krems: AIR - Artist in Residence Program. Zelazny is invited to contribute to Anne Harris's drawing project series, The Mind's Eye, which asks artists to create a 12" x 12" on-site self-portrait. Analog RAM, curated by Mary Lou Zelazny, features the work of over 120 young artists in an extensive series of collaborative collages, assembled from drawings made over 6 years in Zelazny's course Figure Painting — From Photo to Memory. See the collection now as a permanent addition to the Joan Flasch Artist Book Collection at the School of the Art Institute of Chicago. Viewings available by appointment. 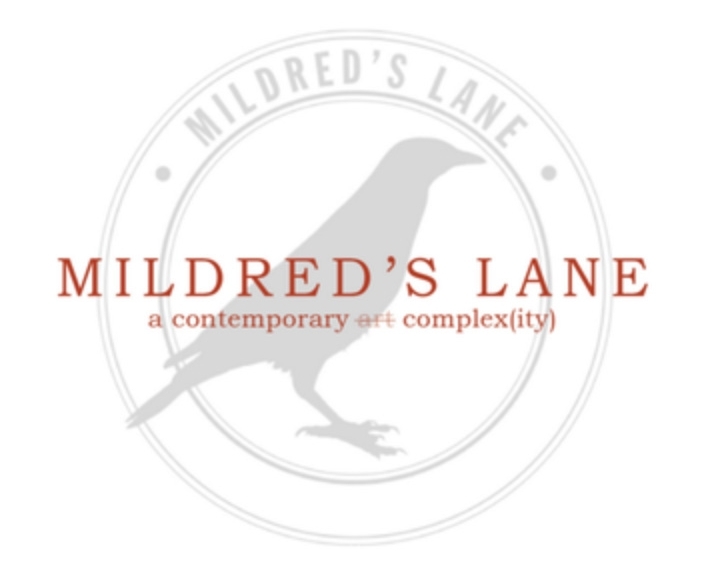 Selections from the Collection of Mildred's Lane Part 1 on view in Narrowsburg includes works by Mary Lou Zelazny, Mark Dion, J. Morgan Puett, Claire Pentecost and others. Zelazny's painting, Sea Walker, on view in Surrealism: The Conjured Life at the MCA. Zelazny is featured on an episode of PBS's Artrageous with Nate, The Artist in Your Backyard. Selections from the Cleve Carney Bequest presents selections from a collection of 300 works bequeathed to the museum by Cleve Carney (1939-2013), a prominent Chicago-area contemporary arts collector and arts supporter. 10 Highlights from the Expo Art Fair, Paddy Johnson and Robin Dluzen, ArtFCity, September 19, 2015. New Works, a solo exhibition of Zelazny's runs April through May 2014 at Carl Hammer Gallery. See paintings from the exhibition here. ~ Mary Lou Zelazny at Carl Hammer Gallery, James Yood, Art LTD, August 2014. Zelazny receives a 2014 Santo Foundation Individual Artist Award. The Exquisite Corpse of the Unknown Veteran is a project organized by Jeanne Dunning and Aaron Hughes. The first iteration of this project was featured in the Surrealism & War exhibit at the National Veterans Art Museum. Zelazny partnered with Lisa Boumstein-Smalley and Geoffry Smalley to create a drawing titled The Exquisite Corpse of Stanistaw Zelazny. "I have chosen my father, Stanislaw Zelazny, because of his WWII experiences. In 1938, at the age of 14, he was kidnapped from his home by the German military for slave labor. 40,000 to 50,000 children aged 14 to 15 were abducted in operation 'Heu-Aktion.' The term means harvesting the hay. After the liberation, my father joined the British reconstruction forces." Made of Iron appears as the cover of Mission at Tenth, Volume 5, published by the California Institute of Integral Studies. Other paintings by Zelazny are also included within the text. Consuming Spirits, an animated feature length film by Chris Sullivan, releases on December 12th, 2012 in New York City. The small cast of this movie includes the work of voice actors Mary Lou Zelazny, Chris Sullivan, Judith Rafael, Robert Levy, Nancy Andrews and Chris Harris. ~ Bones in the Woods, Family Secrets in the Heart, A.O. Scott, The New York Times, December 11, 2012. ~ The 100 Best Animated Movies, Dave Calhoun and Joshua Rothkopf, TimeOut Los Angeles, May 18, 2014. ~ Consuming Spirits, John DeFore, The Hollywood Reporter, December 11, 2012. 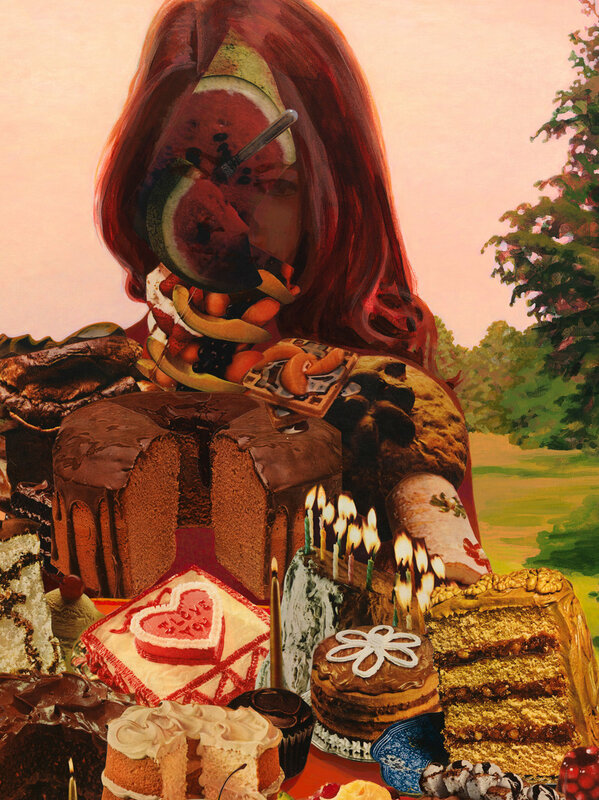 The Cake Lady Returns, a solo exhibition of new work by Zelazny opens September through October 2011 at Carl Hammer Gallery. See paintings from the exhibition here. ~ Review: Mary Lou Zelazny / Carl Hammer Gallery, Brian Hieggelke, NewCity Art, October 4, 2011. ~ The Opening of Chicago's Fall Art Season, Paul Klein, Huffington Post, September 12, 2011. Flags and Swags, a solo exhibition of paintings by Zelazny made between 1996 - 2008 on view the month of March 2011 as part of Elmhurst College Women’s History Exhibition Series. 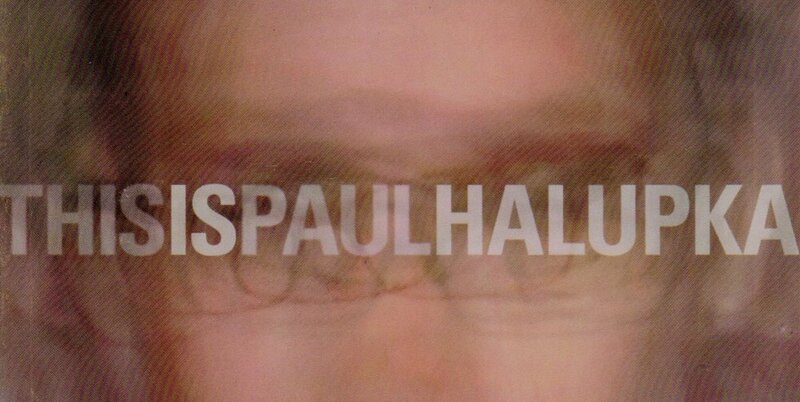 Zelazny featured in the exhibition This is Paul Halupka, curated by Jessica Cochran. ~ A regular guy inspires This is Paul Halupka, Lauri Apple, The Chicago Reader, June 30, 2011. 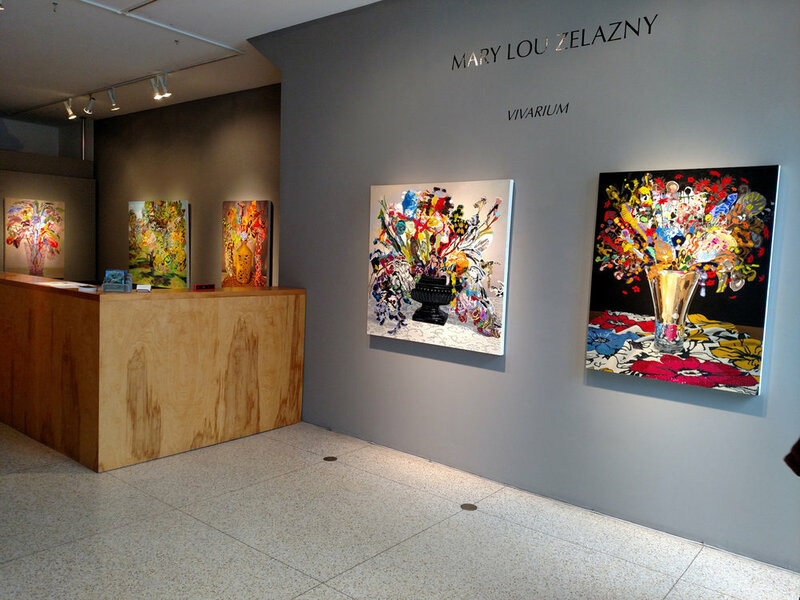 Mixed-media paintings by Zelazny feature in the exhibition Cut Ups. A painting by Zelazny is included in Beyond the Arches: Selected Works from the McDonald's Corporate Collection, a group show which highlights 38 pieces from a collection of over 3,700 works. Chicago Imagism(s), curated by James Yood, exhibits works by Mary Lou Zelazny as well as Chicago artists Roger Brown, Jim Nutt, Hollis Sigler, Karl Wirsum and others…. 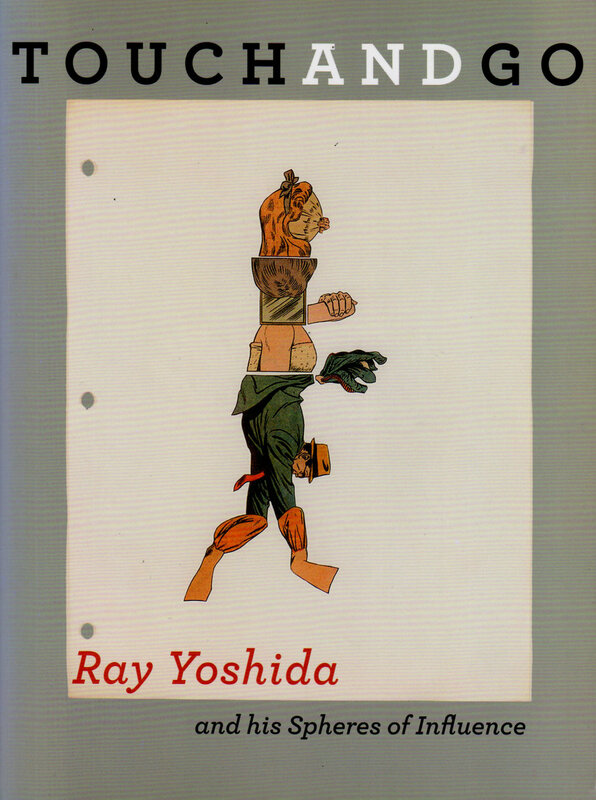 Touch and Go: Ray Yoshida and His Spheres of Influence was a large retrospective of Yoshida's work held at the SAIC. The retrospective also featured selections from Yoshida's private collection, which included the work of Mary Lou Zelazny and other students that Yoshida influenced and later collected throughout his teaching career. Yoshida's private collection now resides at the Kohler Art Center in Sheboygan, WI. Twos, curated by Karsten Lund and others, pairs the work of Mary Lou Zelazny and John Stezaker. 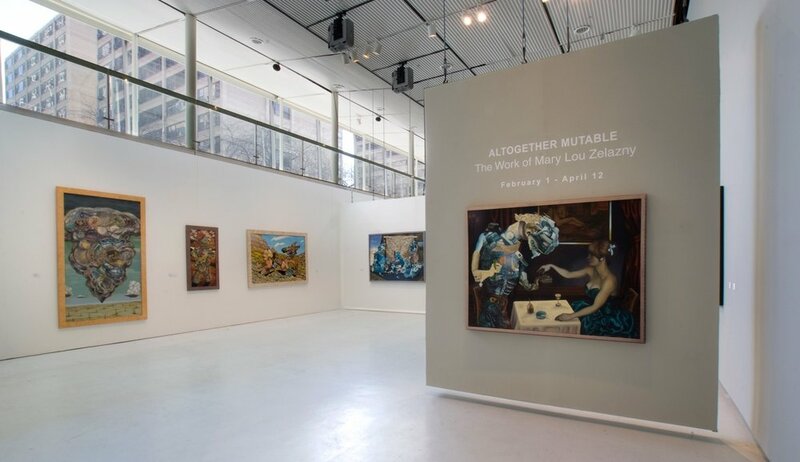 Thirty years of mixed-media paintings are presented in Zelazny's first retrospect, Altogether Mutable: the Work of Mary Lou Zelazny, at the Hyde Park Art Center from February 1, 2009 through April 12, 2009. Accompanied by a fully illustrated catalog with text by curator and director of the Hyde Park Art Center, Allison Peters Quinn, and author John Haskell. More information about the retrospective here. ~ Mary Lou Zelazny, Laura Pearson, TimeOut Chicago, February 15, 2009. ~ Eye Exam: Chicago’s Own Surrealist, Jason Foumberg, NewCity Art, February 16, 2009. ~ Altogether Mutable: The Work of Mary Lou Zelazny, Karsten Lund, Flavorpill, February, 2009. ~ Zelazny's Collages Delight, Alan G. Artner, The Chicago Tribune, March 12, 2009. ~ Dana Boutin Interviews: Mary Lou Zelazny and Allison Quinn, Dana Boutin, ArtSlant, April 15, 2009. 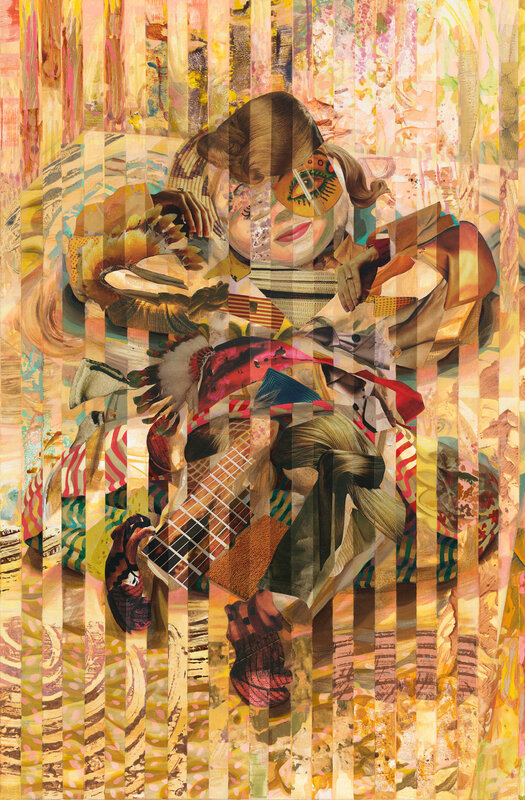 ~ Searching for the Pattern: Mary Lou Zelazny’s collages defy explanation, Brandon Hopkins, Chicago Weekly, March 5, 2009…. Ahh, Decadence!, curated by Lisa Wainwright, highlights works by Chicago-based artists Mary Lou Zelazny, Nick Cave, Jim Lutes, Tony Fitzpatrick and Phyllis Bramson among others. The Lake is Not an Ocean, a solo exhibit featuring paintings by Zelazny at the Union League Club. Repeating the Habit, a solo exhibition of new work by Zelazny opens March through April 2007 at Carl Hammer Gallery. See paintings from the exhibition here.